According to the online Merriam-Webster Dictionary, as of June 2013, chakra is from Sanskirt literally meaning wheel. In Hinduism and Tantra, among other things, chakras are major and minor centers of energy in the human body. Hinduism has 7 major Chakras and Tantra 4. These centers protrude from the front of the body and energetically revolve clockwise and are attached to the spine. These centers of energy or circulating wells are extremely important to the healthy functioning of the body, mind and soul. In the Peruvian Andean and Peruvian Jungle healing traditions and other indiginous people's healing traditions around the world, there are 8 major chakras and they are diagramed below. 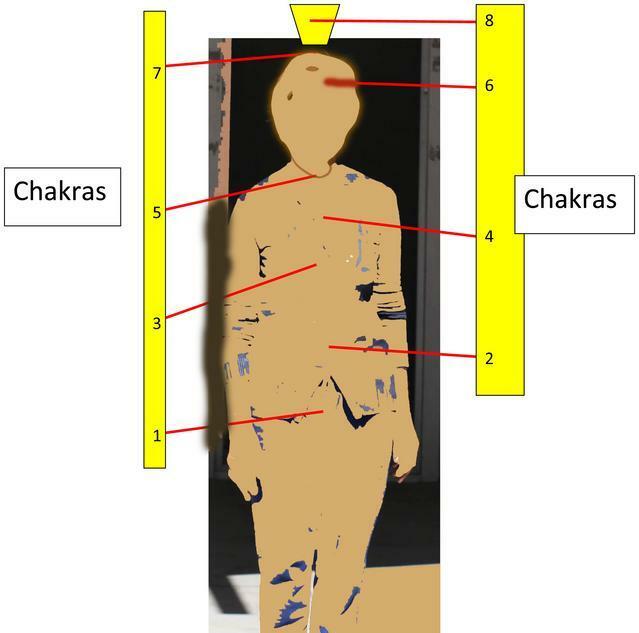 In this healing tradition each chakra has an archetypal energy attached to it. First Chakra is the root chakra connected to Mother Nature and all things natural including procreation and the energy attached to it is serpent. Second Chakra is about fundamental survival and the cycle of life and death, and the mulching of negative energy and returning it to nature. It is about emotions and is represented by Jaguar. Third Chakra is all about the souls journey and about honoring all who have come before us and who will come after us. It is represented by Humming Bird, the great and brave journeyer. Forth Chakra is the heart chakra and is represented by Eagle. Fifth Chakra is the throat chakra and is represented by Huascar who was historically a Inkan priest. Huascar is keeper and lord of the the underworld. Sixth Chakra is located at the center of the forehead and is sometimes referred to as the third eye. It is represented by Quetzalcoatl, lord of the dawn and of the mid-world. He is the winged serpent as well as an historical character of Mesoamerica. Seventh Chakra is located at the top of the head and is represented by Patchakuti, an historical Inkan Prince and he is the keeper of the gateway to the soul. Eighth Chakra is the seat of the soul and of our higher intelligence where all of the knowledge and information necessary to reincarnate the soul or to send the soul to spirit resides and is again represented by Eagle who touches Spirit and the Infinite.